On May 7, 1940, the House of Commons began perhaps the most crucial debate in British parliamentary history. On its outcome hung the future of Prime Minister Neville Chamberlain's government and also of Britain-indeed, perhaps, the world. 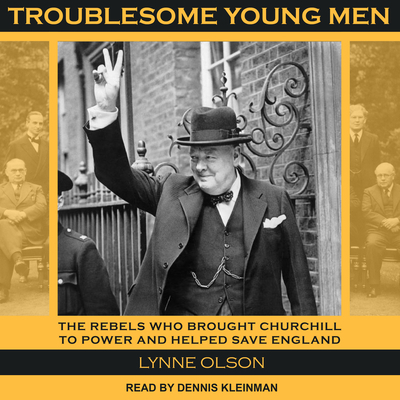 Troublesome Young Men is Lynne Olson's fascinating account of how a small group of rebellious Tory MPs defied the Chamberlain government's defeatist policies that aimed to appease Europe's tyrants and eventually forced the prime minister's resignation. Some historians dismiss the "phony war" that preceded this turning point as a time of waiting and inaction, but Olson makes no such mistake, and describes in dramatic detail the public unrest that spread through Britain then, as people realized how poorly prepared the nation was to confront Hitler, how their basic civil liberties were being jeopardized, and also that there were intrepid politicians willing to risk political suicide to spearhead the opposition to Chamberlain-Harold Macmillan, Robert Boothby, Leo Amery, Ronald Cartland, and Lord Robert Cranborne among them. The political and personal dramas that played out in Parliament and in the nation as Britain faced the threat of fascism virtually on its own are extraordinary-and, in Olson's hands, downright inspiring.